"Brilliant position and the lake trip superb. The service though only average." "We spent all morning chimp trecking and did not see any, I know this can happen but was told it was fairly normal there. It might be good to tell people that when they do activities, ie the walks at the impenatrable forrest, they will be taken to schools, hospital and various places where entertainment has been put on and they will need small notes to compensate. I know it is not essential, but it is expecte"
"This was the least special of all the places we stayed. Room was shabby and place was impersonal. Would rather have stayed in another smaller lodge." "Pure luxury and well timed!" 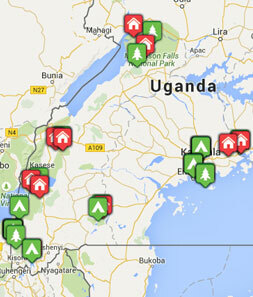 Start planning your tailor-made holiday to Uganda. Tell us what you want, and we will tailor make your perfect trip.  Flight time: Direct from UK flights 3 times a week or daily via Nairobi.  Language: English is the official language, with Luganda and Swahili also widely spoken.  Visas: Visas are required for UK citizens which can be purchased on arrival at the airport. Passports must be valid for at least 6 months.  Health: No compulsory vaccinations but several are recommended and you should take malaria prophylactics.